Mark Rayner makes a simple wall planter for herbs and other plants. You will need: A piece of 22mm treated plywood, four terracotta pots, four Leylandlatch green pot hangers, 60mm stainless steel screws, saw, tape measure, pencil, set square, sandpaper, paintbrush, screwdriver, good quality potting mix and four herb plants. Resene Terracotta Sealer, Resene Quick Dry waterborne primer undercoat, Resene Lumbersider tinted to Resene Limerick and Resene Moxie. 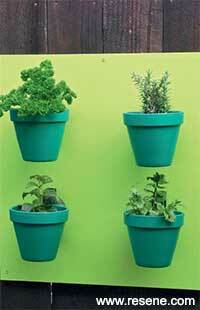 Another idea: Fix a horizontal strip of treated plywood to the outside of a kitchen windowsill and hang a row of terracotta pots from it to create an accessible herb bed. Measure, mark and cut the plywood to make a square measuring 600mm x 600mm. 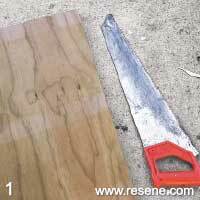 Smooth any rough edges with sandpaper. 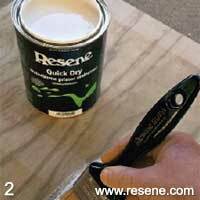 Apply one coat of Resene Quick Dry to both sides and the edges of the plywood and leave it for two hours to dry. 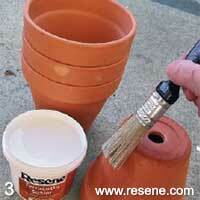 Apply one coat of Resene Terracotta Sealer to the inside and outside of the pots and leave this to dry. 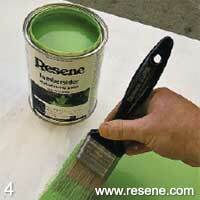 Apply two coats of Resene Limerick to both sides and the edges of the plywood and allow two hours for each coat to dry. 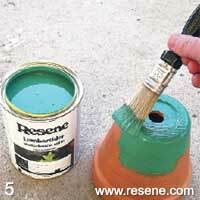 Apply two coats of Resene Moxie to the outside and the inner rim of each pot. Allow two hours for each coat to dry. 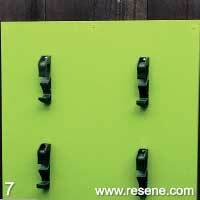 Place the four pot hangers on the piece of plywood, as shown, and then screw partially into position. 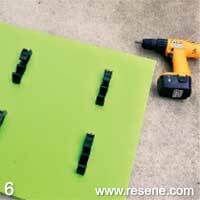 Screw the plywood to a fence or timber wall with 60mm stainless steel screws, drilling pilot holes first. Spot paint the screw heads. Screw the pot hangers firmly into position. 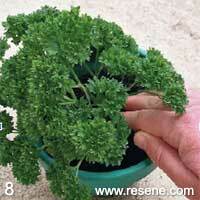 Plant up each pot with good quality potting mix and a herb plant and then hang it in position from the pot holders.